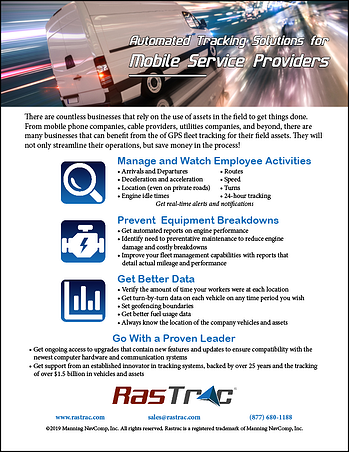 Mobile service providers often keep a lot of assets in the field. Ensuring these assets are operating a peak efficiency is key to remaining competitive and cost-effective. Giving you the ability to monitor and track driving behaviors such as speed, idle time, and route adherence. Interfacing with a vehicle's on-board diagnostics system to identify when preventative maintenance is needed. Set geofencing boundries to keep service vehicles from going outside the service area. Find your driver's location in more than 60 countries, even on private roads.